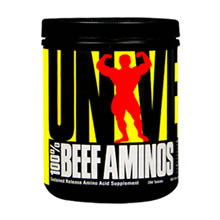 If you'd like to see if 100% Beef Aminos contains substances that are banned by your sports organization's Banned Substance List, sign up now or log in. Declared Ingredients Other Ingredients: 100% Beef Amino Acid Complex (beef protein isolate, beef albumin concentrate, dessicated Argentine beef liver, dicalcium phosphate, microcrystalline cellulose, stearic acid, magnesium stearate, water, lecithin (soy), pharmaceutical glaze. Typical Amino Acid Profile: (L-Leucine (Branched Chain Amino Acid), L-Isoleucine (Branched Chain Amino Acid), L-Valine (Branched Chain Amino Acid), L-threonine, L-Lysine, L-Phenylalanine, L-Tryptophan, L-Methionine, L-Histidine, L-Arginine, L-Aspartic Acid, L-Alanine, L-Cysteine, L-Glutamic Acid, L-Glycine, L-Hydroxyproline, L-Proline, L-Tyrosine, L-Serine). Have a question about 100% Beef Aminos Use our secure online messaging system to ask our Aegis Shield Experts.